Suffolk Federal is proud to announce the promotion of Richard Klefsky to Senior Vice President of Retail Banking located at the Medford branch. In this position, Klefsky oversees all aspects of operations, member services, employee performance, product research and strategic development for retail banking. Klefsky additionally oversees all facilities making certain that all credit union branch locations are operational and running efficiently to ensure the highest quality visitor experience. 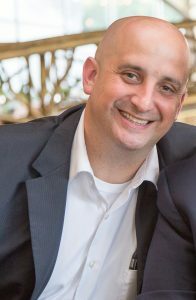 Klefsky joined Suffolk Federal in 2004 as Regional Director of Branches and Call Center and prior to his current position, served as Vice President of Risk Management and Vice President of Retail Banking. Klefsky earned his Bachelor’s degree in Economics with a minor in finance from SUNY Oneonta. Previously, Klefsky was certified as a Compliance & Security Expert by the Credit Union National Association. He is an avid supporter of LI2DAY Breast Cancer Walk, an organization that raises awareness and funds breast cancer research; and the Alzheimer’s Association, an organization that raises awareness and funds Alzheimer’s disease. Klefsky resides in Shirley with his wife and two daughters.